IDAC, the international two day industry conference, staged for the first time in London at erpec 2015, will bring together retail fuel executives and international equipment providers from across the globe to ‘Talk Business’ for three days, in the heart of Amsterdam, one of the world’s most popular international destinations. 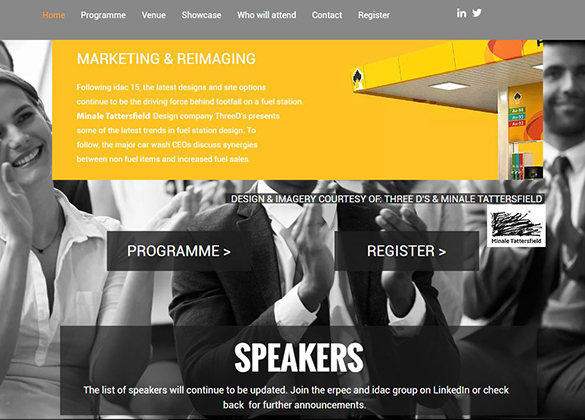 Minale Tattersfield 3Ds design has been contributing to this two-day industry event since 2015, when we presented many of the innovative designs we had created for both multinational brands and local roadside retailers. We are excited to continue to support IDAC in 2017 showcasing more on the design challenges and various brand successes we have experienced over the years while working in this dynamic and vibrant sector.  At Minale Tattersfield 3Ds design we have always produced designs that work harder. Since an important consideration for many petrol retailers is the size of their networks (shell 50,000, BP 25,000, Agip 20,000 and Total 15,000), cost is clearly a key factor and designs need to be practical. For this reason, an individual architectural gesture is very difficult to achieve across a whole network. During IDAC2017, David Davis, 3D designer, will showcase Minale Tattersfield's forecourt designs which have made not only a considerable contribution to the success of our clients, but also contributed to the evolution of the petrol station. 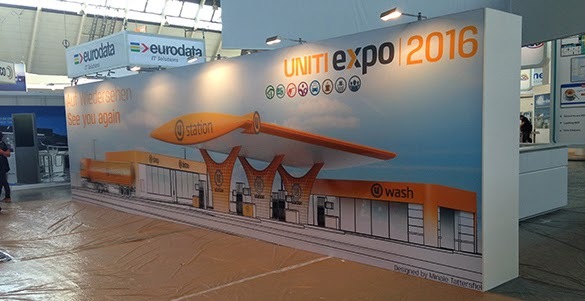 Uniti expo trade fair kicked off for the first time at the amazing Stuttgart Messa Germany from the 3 – 5 June 2014 exhibiting everything to do with what's new on and under the forecourt including a complete hall dedicated to convenience retail and food to go. For us at Roadside Retail it was a good chance to rub shoulders with the great and the good in the business and hear first hand what is going on and present at the International Forum our own views of what the priorities are for the future from a global perspective. David Davis, Head of Energy Retail Design at Minale Tattersfield, and a guest speaker at this year's Future of Forecourts Forum and Zukunftsforum Tankstelle felt the experience "Worthwhile and fitting that a business as developed as forecourt fuel and food retail should have its own European showcase and mouthpiece". The next Uniti expo is 2016. www.uniti-expo.de. Sainsbury’s latest ‘Local’ petrol station and convenience store in Putney SW London is notable for us in the petrol retail business for its skeletal single skin canopy devoid of the normal lower second false skin comprising flat ceiling strips that are to be found on older Sainsbury’s canopies and virtually all other petrol station canopies throughout the world. The other notable omission is the brightly decorated canopy fascia in favour of large canister letters. The question is, are Sainsbury’s bravely rethinking the concept of the petrol station canopy or recklessly under-branding their outlet? Judging by the steady flow of customers on the sunny spring Saturday morning we visited the answer is more likely the former. So what are the benefits of Sainsbury’s minimal approach? With around 250m2 less under-decking at say $30/m2 and 80m less fascia at say $150/m then there may be an overall saving of around $20,000 which may be around half the overall cost of the complete canopy. On the cost plus side, canister letters would cost at least $2,000 and there would be an additional cost to finish the canopy steelwork in a more durable and presentable white paint as opposed to the normal galvanised finish. 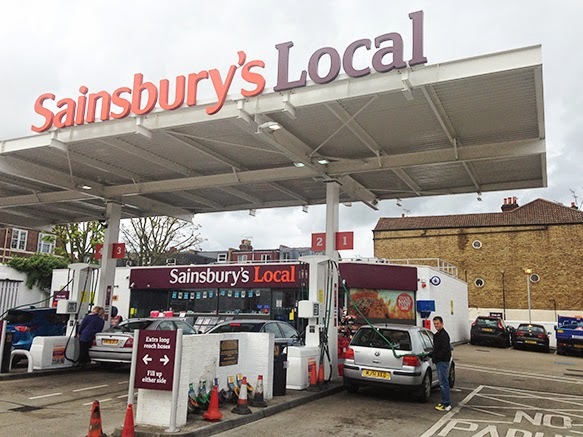 Other drawbacks of the Sainsbury’s design include having to mount the LED task lights on to the main beam above the pumps rather than normal location between the pumps which affords the best vertical illuminance of the pump and spreader. Removing interior false ceilings has been the trend in many forms of retail for decades now as it provides the opportunity for a higher ceiling and more of a warehouse look suitable for certain fashion outlets and discounters. That Sainsbury’s has extended the same logic to exterior canopies should not therefore surprise us. We say the Sainsbury’s brand is strong enough for consumers to feel equally comfortable under a minimal canopy as a conventional canopy. 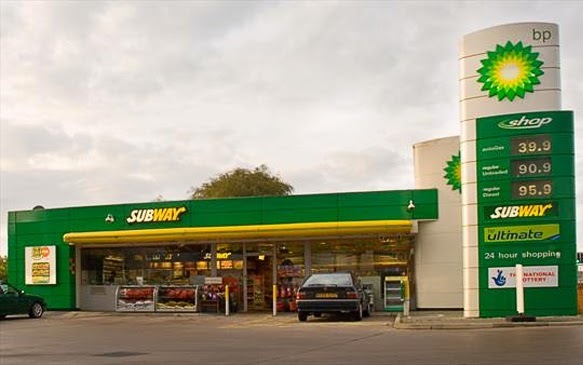 For less well known brands including independent petrol station outlets we guess the minimal approach may suggest a lesser quality fuel unless the design is executed with skill and does not look like a crude agricultural building. By definition minimalism has less components but those components must be perfectly detailed which alas is slightly lacking with Sainsbury’s design which has unsightly bracing members confusing the lines of the structure. Overall we say Sainsbury’s have earned their $20,000 saving by cleverly thinking out the box. Whether it’s a trend others may follow remains to be seen. The secret is out. Winxo is the new name of the Moroccan oil company, CMH. Unveiled recently to the public on 3 February, Winxo’s new flower logo identity and forecourt branding marks an important step change for the company and will see customers benefit too. 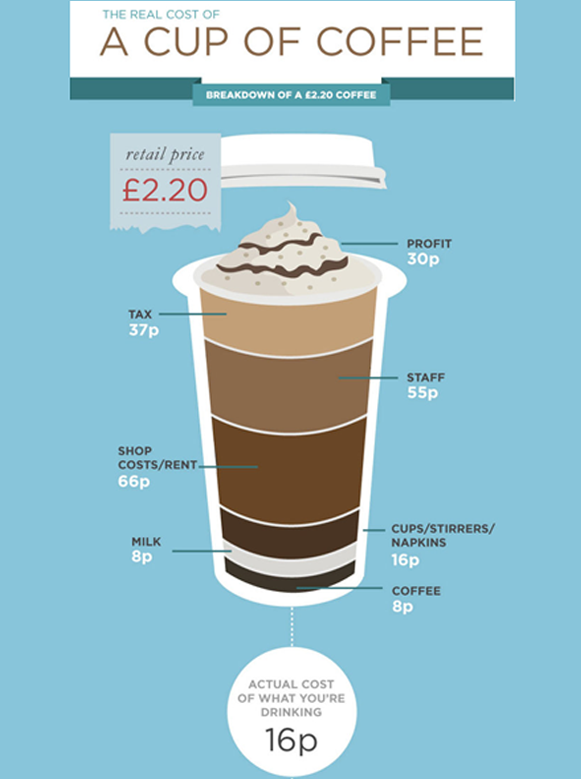 The real cost of coffee is just 8p according to a recent report by Allegra Strategies. When all costs are taken into account, that’s a net profit of 30p on every cup sold. Does this breakdown chart offer an indicative model for roadside cafe retailers or should it taken with a proverbial pinch of sugar? 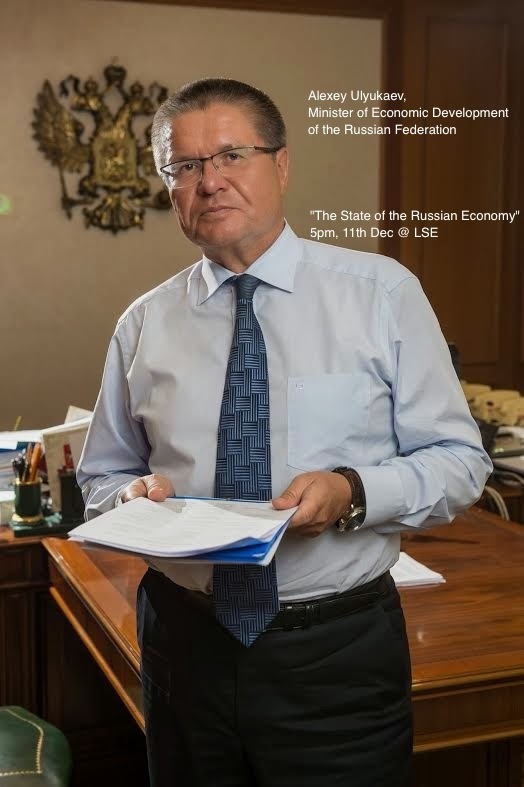 Russia's Minister of Economic Development, Alexei Ulyukayev, was in London this week. Talking to a packed audience at the LSE, hosted by LSE SU Russian Business Society, Mr Ulyukaev spoke candidly about the challenges ahead for Russia in its efforts to create modern and efficient industries. We have just learnt that the LSE SU Russian Business Society is hosting a talk by the Minister of Economic Development of Russia, Alexey Ulyukaev, titled "The state of the Russian Economy: goals and prospects"
A multidimensional retail destination made up of food and drink coffee franchises continues to be an important revenue generator, especially those with sit-down restaurants, food to go and drive-thru outlets.